...Corner unit (largest unit from the same row). 725-X, Jalan Sungai Dua, 11700 Gelugor, Penang. (Lastuse of the row) Help direct owner to sell it. Interested pls call Nicol Tan 012-491 9--- for viewing. Located at Sungai Dua Mainland. Location: Medan Murai, Sungai Dua Land area: 2250sf Type: Single-storey semi-detached Bedr. Nice unit. Easy access to north south highway. Those interested, please kindly contact Ms Goh 017-5147--- for viewing arrangement. 2s Semi Detached Land Area: 2500sf 4 bedrooms and 3 bathrooms Vacant Well maintained. ...guarded community. This development comprises 12 units of semi-detached and 115 units of terraceuses. Close to Sungai Dua high way inter change. ...Built up: 24 x 50 @This development comprises 12 units of semi-detached and 115 units of terraceuses. Close to Sungai Dua high way inter change. 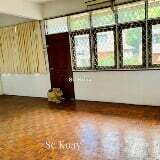 2sty, Semi-D, Taman Desa Murni, Sg Dua, 13800 Butterworth, Pulau Pinang Asking Price: RM730.